This is what the ‘Think Inside The Box’ post was about, a project I’ve been working on for the last few months but feels like I’ve been working towards for over a decade. 10 years ago I actively started contacting and interviewing the people involved in the creation of the ZTT label’s artwork, starting with Paul Morley who I collaborated with on ‘Raiding the 20th Century’. Through the years after I met designers, illustrators and photographers who had all had hands in the late 80′s output of the label whilst collecting promo posters, magazine ads and in some cases original artwork and photos. 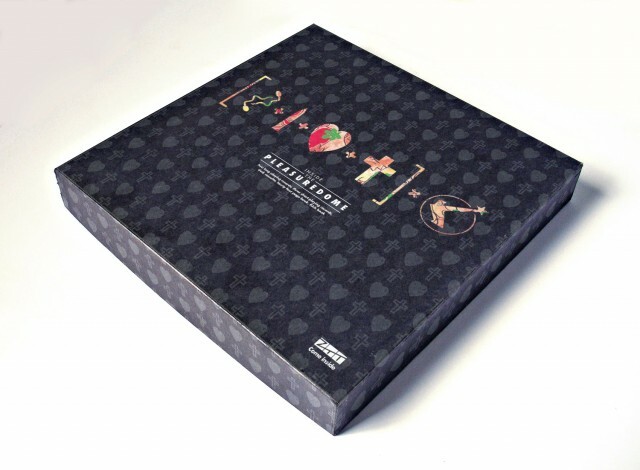 After starting this site early last year and having been in contact with Ian Peel for close to a decade, responsible for the ongoing reissue series at the label, I was asked to collaborate with resident designer Philip Marshall on what would become the 30th anniversary of Frankie Goes To Hollywood’s ‘Welcome To The Pleasuredome’.